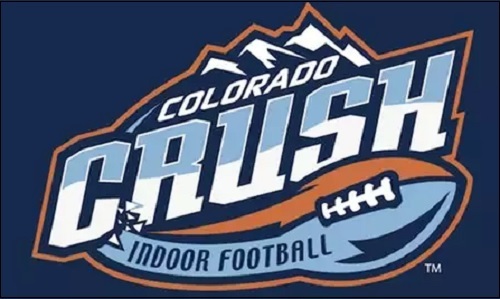 The player who ultimately lifted the Colorado Crush to their first win of the season has earned the team's first honor of the season. Kicker Spencer Groner was named IFL Special Teams Player of the Week by the Indoor Football League for week seven. Groner booted a 36-yard field goal as time expired to lift the Crush over the Salt Lake Screaming Eagles, 52-49 on March 31. Groner hit two of his three field goal attempts during the game, including a 50-yarder midway through the fourth quarter. He also hit four of his six point after attempts in the game. On the season, He has converted on seven of 16 field goal attempts during this season, including four of five from 39 yards and closer. He has made 16 of his 23 point after attempts, and ranks first among kickers in scoring this season in the Intense Conference with 37 points. Crush wide receiver Kyle Kaiser made the Honorable Mention list for Offensive Player of the Week for his five receptions, 77 yards and three touchdowns. The Honorable Mention list for Special Teams Player of the Week were: Kick returner Manny Asprilla (Green Bay Blizzard), kick returner Marcus Barnett (Cedar Rapids Titans), kicker Jeff Budzien (Green Bay Blizzard) and kick returner Jamal Miles (Arizona Rattlers). Quarterback Charles McCullum of the Wichita Falls Nighthawks was named the Offensive Player of the Week for his role in the Nighthawks' win over the Arizona Rattlers, and linebacker Nikolas Sierra was named Defensive Player of the Year as his Nebraska Danger defeated the Spokane Empire. In addition to Kaiser, the other honorable mentions for Offensive Player of the Week were: Running back Ketrich Harmon (Arizona Rattlers), wide receiver Jordan Jolly (Wichita Falls Nighthawks) and running back James Poole (Salt Lake Screaming Eagles). The Honorable Mention list for Defensive Player of the Week were: Defensive lineman Joshua Gordon (Arizona Rattlers), defensive lineman Andrew Jackson (Spokane Empire), defensive back Curtis Thomas (Cedar Rapids Titans) and defensive lineman Walter Thomas (Wichita Falls Nighthawks). The Crush, who dropped their first five games, are now 1-5 with their win over the Screaming Eagles in week 7. Colorado has a bye week. They will visit the Spokane Empire on Friday, April 14 for a 7 p.n. (pacific time) kickoff. SCtoC will feature a preview and game thread for that game. Good to see the Crush get a POTW instead of giving one up. Great honor for Groner. I think this was well earned with the game winner along with the 50 yarder. Congratulations to Spencer!